All week long the amazing bloggers that I teamed up with for the Virtual Thanksgiving Dinner, have been sharing their recipes for Easter Dinner. Laura started the week with her delicious Mustard Orange Glazed Ham, then Shaina added a wonderful Spring Orzo Salad, Tara shared an old family favorite, Hungarian Cucumber Salad, Tiffany created some Goat Cheese Biscuits that look and sound amazing, Aimee added a Potato Rosemary Strudel with a how-to video, and today I am adding the dessert. This post is also a milestone… #1000!! WOW!! I can hardly believe I have written and published 1000 posts! I am absolutely having the time of my life and LOVE every minute of what I do! Even as I sit here in a disorganized office looking at my Dining Room table full of cupcakes and boxes from goodies for the Mother’s Day Giveaways. As the holidays approach, our grocery budget usually gets stretched quite a bit. And even sometimes, we have a get-together to go to and would like to take something spectacular and delicious, but don’t want to spend tons of time and more importantly, tons of money. 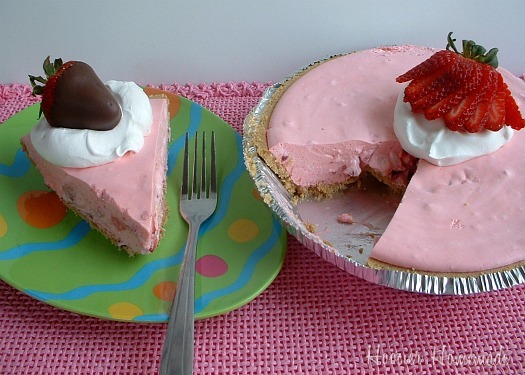 This Easy Strawberry Pie can be made ahead, which is always a good idea when you are trying to prepare Easter Dinner. Even though it’s an easy dessert, our family looks forward to having it every Spring. Stir boiling water into gelatin mix in large bowl, stir at least 2 minutes until gelatin is dissolved. Add ice cubes to cold water to make 1 cup, stir into gelatin mixture. Add whipped topping with a whisk until well blended. Refrigerate 20 to 30 minutes. Prepare the crust by mixing all ingredients and pressing into a pie dish. Bake at 350 degrees for about 10 minutes. Cool completely. Spoon filling into crust, chill for 6 hours or overnight. 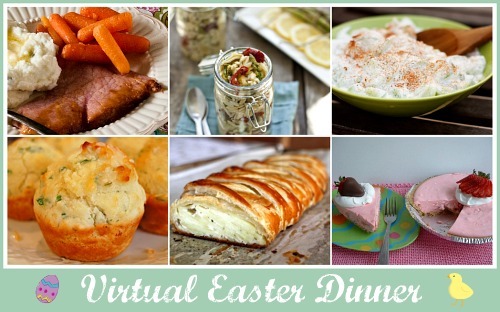 Join us for our Virtual Easter Dinner! The Easy Strawberry Pie is adapted from Kraft Food & Family, Spring 2008 issue. Do you have a favorite dish you serve on Easter? We loved this pie for Easter. I used more strawberries in the sauce than it called for. I am so happy you loved it! Thanks for using our recipe! This pie looks so good Liz, thanks for sharing it with us at RecipeLion.com. I love no bake pies, I also like how they’re usually pretty cheap too. Thanks again! This looks so good. I love how easy it is too. Thanks for sharing this one. I’m stopping by from Eat at Home. Congrats on 1,000 posts!!! Looks tasty, and I love that you can make it ahead! Strawberries are perfect for Spring! Congrats on 1,000 posts! The pie looks so yummy and easy enough to make. So pretty, Liz! I love creamy fruit pies and strawberries rank right up there. I’m curious to see how my kids would like your pie. I’m willing to bet it would be an easy new family favorite. Oooh! I love that pie. So refreshing and spring-like.